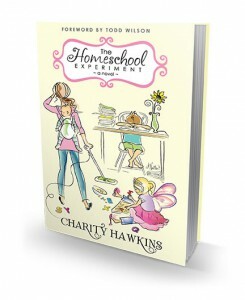 The book is a cross between Confessions of a Shopaholic and The Girlfriend’s Guide to Homeschooling, if there were such a thing. There needs to be. Because none of my homeschooling books ever covered how to finish your read-aloud when your baby just had a blowout all over the high chair, and you finish giving him a bath only to find that your oven fries were burned to a crisp, and you barely got those thrown out when you had to run to the living room because of the screaming and blood to find that your daughter just accidentally knocked your son’s loose tooth out by kicking him in the face. Accidentally. While they were supposed to be waiting for you to finish reading. None of my books covered that.